This was the moment Walker learned that she earned the lead role in American River College’s production of “In Love and Warcraft,” and now there was no way that she was falling asleep. Walker, a freshman at ARC, said she was surprised because this is her first college production. “I wasn’t reaching for the lead role. I considered doing ensemble or anything because I really didn’t think I had the potential of getting a lead role,” Walker said. This rom-com production is about 22-year-old college student Evie, who is more absorbed in the online gaming world of World of Warcraft than real life. When Evie is not leveling up, she writes online love letters for other people for a living; one of her clients is her love interest, Raul. Walker described Evie as a individual who is unsure of herself, and feels any young adult can relate to her character. “She’s insecure in a way that I am insecure and many young adults are and it’s hard to differentiate myself from her sometimes when I am acting on stage because she’s so relatable,” Walker said. Performing on stage is not new for the freshman; she said she has always had a knack for performing since she was young. She remembers singing since she was 4-years-old and showcasing songs she wrote at her elementary talent show. It wasn’t until she arrived at Rio Americano High School, however, when she literally found a script in her hand. It was her first week in high school and Walker was waiting for her dad to pick her up after school. Her friend spotted Walker and asked her to come and support her in auditions for “Alice and Wonderland.” With only 20 minutes to spare until her father showed up, she and her friend rushed to the theater. Catching her breath, Walker stumbled to sit in the row of chairs but as she sat down the school director locked eyes with Walker and immediately handed her a script. Explaining she was not there to audition, the director urged her to read the script anyway. Walker got up on stage and read the lines before she could get an reaction on her performance she quickly rushed out of the door to meet her dad. That same day, Walker found herself going back to school to talk to the director. “I knock on the door and the director talked to me for an hour and she said you have a lot of raw talent and asked me why I haven’t done this before,” Walker said. Walker said she can always rely on one person to attend all of her plays — her number one fan, her father, Kevin Walker. He said he is proud of his daughter’s accomplishments and encourages her to follow her passion. The young actress says her inspiration and influences come from watching classic stars like Meryl Streep and Winona Ryder, but her biggest Hollywood influence is the acting style of none other than the famous Johnny Depp. 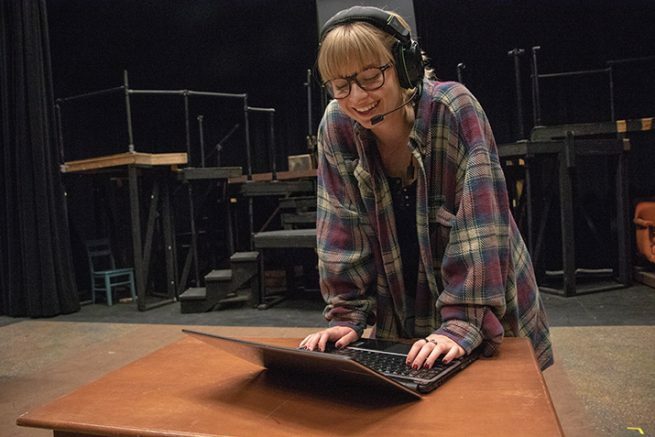 Pursuing a degree in theater arts, Walker hopes to explore all aspects of acting including on-stage and in front of the camera while she’s in the program. Walker feels that the ARC theater department has not only has great staff, but great people which includes her cast mates. One of the cast members, Naum Josan, who plays Evie’s boyfriend Raul, said he enjoys Walker as a cast member and is impressed with her ability to take on her role. Hard work is all the young actress knows because she is aware of how competitive the industry is, therefore giving up is not an option. “Theater is all about trying again even though you may fail more than you succeed don’t beat yourself about it,” Walker said. Be the first to comment on "Walker walks into lead role in ARC production"